Sorry we’ve been MIA for a while. Nothing bad has happened, but we’ve neglected the blog a bit in favor of interacting face to face with people. This has resulted in a bunch of posts that will be forthcoming, so stay tuned. We’ll start with today’s adventures and work backwards in the coming days until we’ve caught up! “Vaccinations” might be an odd title for this post considering that we’re not little babies any more and we’re not traveling to any crazy places. Uruguay is not a third world country and does not have any crazy disease carrying monster insects. Well, turns out that we will be traveling to a crazy place with crazy disease carrying monster insects while my parents are here visiting in a couple weeks. We are traveling to Iguazu Falls which is in the northern-most part of Argentina and borders Paraguay and Brazil. It’s the jungle and the mosquitos in that jungle sometimes carry yellow fever. It is recommended for people traveling to this area to get vaccinated for yellow fever, but it is not required. See these sources about yellow fever and where vaccinations are required: National Institutes of Health and Vaccination Info. Since yellow fever is a very serious disease and at the request of my parents, we got vaccinated for it. 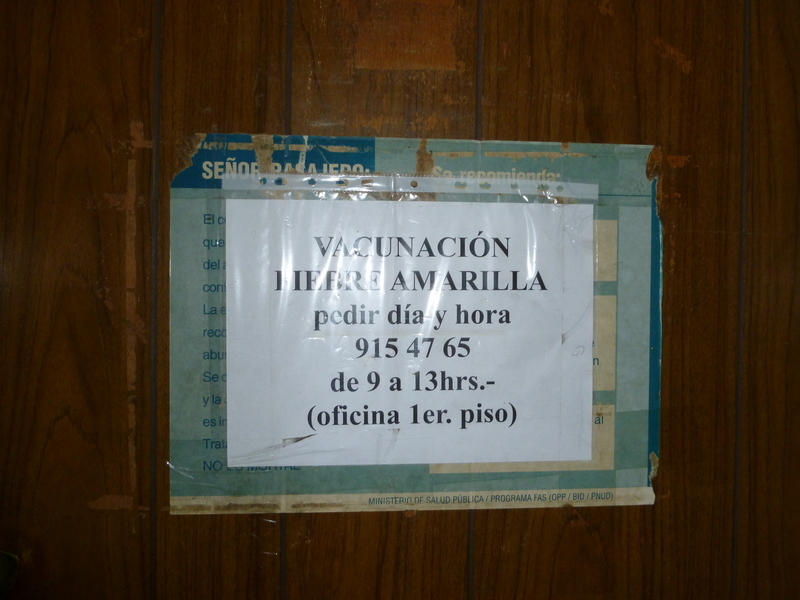 Montevideo has a dedicated office at the port for travelers who want to be vaccinated against yellow fever. I imagine this is because there is a very real risk of yellow fever in many northern parts of South America and many countries require travelers to be vaccinated against it before being granted entry into the country. This is definitely the case for travelers to Brazil. So what does one do to actually get vaccinated for yellow fever? Well it’s a four step process. The first step is a phone call. This was a very interesting step considering my tenuous understanding of the spanish language and the lack of facial expressions and hand gestures for contextual support. After figuring out how to actually make a phone call on my cell phone (dial 0 and 2 before the number in case you’re wondering), I fairly easily stated what I was calling about, told the nice lady where we were traveling, and set up an appointment for 9 am Friday morning. Then she said she had some questions to ask me. I understood that, but could not for the life of me comprehend the actual questions she asked me. This became apparent fairly quickly and she handed the phone to a man who’s english was just as bad as my spanish. After some exchanges in “spanglish” I managed to answer the questions to his satisfaction and he wished me happy travels and hung up. The second step in getting vaccinated against yellow fever is to figure out where the heck the office is. 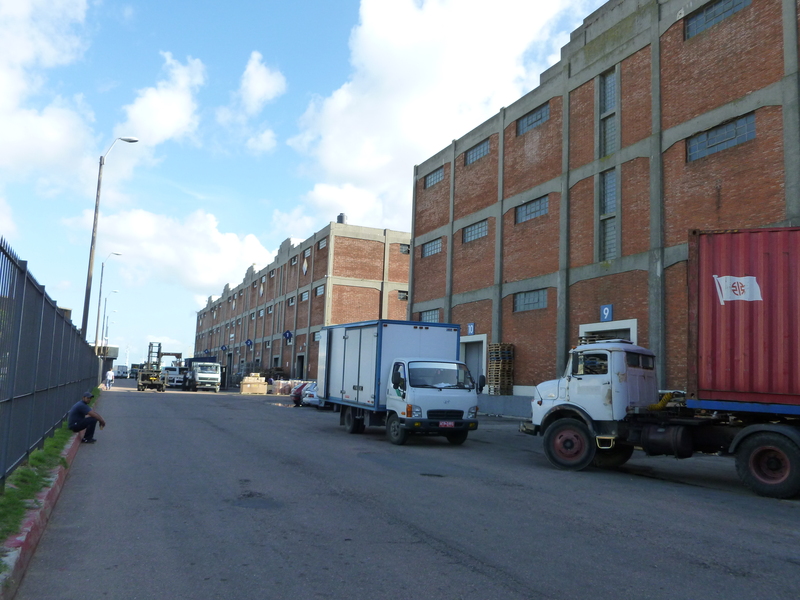 The office of “Sanidad de Fronteras” is at the port of Montevideo, which is a fairly large place. There is a cruise line terminal, the buquebus (boat to Argentina) terminal, and a variety of large and imposing brick buildings. On google maps it was very clear where we were suppose to go. Unfortunately reality sometimes doesn’t look like google maps. What did we do? We asked someone who said to go until reaching the big brick building and the office was at the end. He also pointed in the direction we should be going. At the end of this brick building there was a pair of glass doors that looked like it could be a doctor’s office. We went in and asked again and were told it was around the corner. As we were walking out one of the dock crew smiled and pointed around the corner. Guess we’re just that apparent. Looking toward the end of the very large brick buildings. The Sanidad de Fronteras is at the very end! Well we got to the unlabeled door around the corner and went in. Signs were plastered everywhere saying that the yellow fever office was on the first floor, so we went up. The unmarked doorway to the vaccination clinic. Signs posted up in the office. 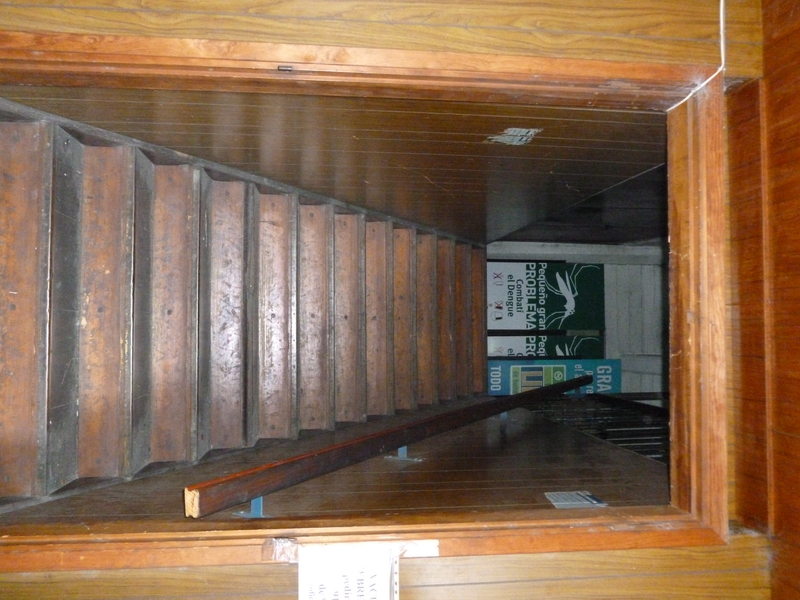 Stairway up to the vaccination office. The third step in getting vaccinated against yellow fever is waiting to get the shot. 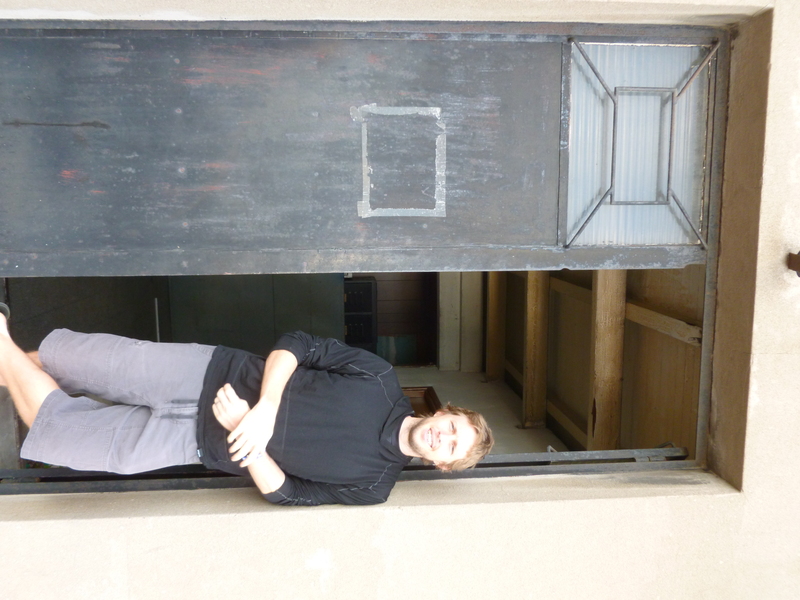 On going upstairs, we found ourselves in a dark foyer with several closed office doors (looking deserted), a locked bathroom, and one door in the corner that said “Fiebre Amarilla” (i.e. yellow fever). There were 5 people already standing in the foyer. They had all made appointments for 9 AM and were upset about having to wait in line and apparently it doesn’t matter if you make an appointment because they just call the next person in line. While we were waiting the man behind us saw our passports and asked incredulously if we needed them, at which time we told him that we were from the United States and that we were told to bring them. Our answer quelled his fears and he asked us where we were traveling. The fourth step in getting vaccinated against yellow fever is actually getting the shot. We were called into the office which consisted of one room containing three people: a woman acting as receptionist, a man answering phones, and a nurse. The room had a couple desks which the first two people were sitting at and a corner with a curtain where the shots were actually administered. The nurse was wonderful and put us at ease right away while the receptionist took our information and drew up our international vaccination cards. We paid $352 pesos each (about $17US) for each shot, and that was only because we didn’t have international vaccination cards already. I think the shot is free for Uruguayan citizens. Before we actually got the shots we had to answer a bunch of questions, many of the same ones that I had already answered on the phone: allergic to eggs? allergic to antibiotics? pregnant? and other vaccinations in the last 30 days? The she gave us some mandates and advice… Don’t get pregnant in the next 3 months (check! ), keep eating and exercising regularly, and if we got a fever to just use an over-the-counter remedy. All this in spanish. She spoke slowly and deliberately, but we both understood every word she had to say which also put us both at ease. The shot itself may have been the least painful shot I have received in my adult life. Here’s to hoping that there aren’t any side effects! We thanked them heartily and made our way home. This entry was posted in Communication, Travel and tagged Argentina, cell phone, Iguazu Falls, nurse, Port of Montevideo, spanish, vaccination, yellow fever by mlwattsupp. Bookmark the permalink. The appointment timing sounds about the same as a doctors appointment in the states. I have heard that many remedies that are controlled substances here may be available just over the counter there. True? How does your health care work there anyway? Do you have a doctor or clinic to go to? We haven’t had anything that’s worth the time of dealing with health care. Basically, everything here is just covered as out-of-network. We would have to deal with all the paperwork and all that as no doctor here would know what to do. I went to Kenya and Tanzania without my yellow fever shot so had to bribe people in order to enter the country. Glad i didn’t get bit by a mosquito. It really freaked me out because at several lodges, I slept under mosquito netting. So…it’s good to get your shots. Have fun with your parents/in-laws next week. We’re very jealous!! !